First Class Limo Hire Brisbane, Gold Coast, Sunshine Coast! Brisbane Premier Limo Service has a "limo hire" for every occasion. We provide limousine transfers from the Brisbane airport, Gold Coast airport and the Sunshine Coast airport in our prestige limousines. Corporate transfers are available in our executive limousines from Brisbane, Gold Coast and Sunshine Coast airports as well as directly to and from your business destination or corporate event. Choose from our range of luxury cars to arrive in style for your Wedding, Formal or Special Event. Leave your vehicle at home and relax with a hassle-free journey to and from the venue with our limousine hire. ​so you arrive refreshed at your destination. Arrive, on time, relaxed and in style. Don't look further than Brisbane Premier Limo Service. We offer a prestige limousine service experience with a real difference. Brisbane Premier Limousine Service is a family owned and operated Brisbane based business. Our personalised customer service allows for seamless travel arrangements which will ensure your luxury car travel is to the highest standard. We thrive on offering the best limousine service in Brisbane. Brisbane Premier Limo service has a limo hire for every occasion. Airport Transfers – we provide Brisbane airport limousine transfers, Gold Coast airport transfers and Sunshine Coast airport transfers in prestige hire cars. Corporate Transfers – corporate transfers including personalised service in executive limousines from Brisbane, Gold Coast and Sunshine Coast airports direct to and from your business destination/corporate event. Wedding Car Hire – choose from our range of luxury cars and arrive at your ceremony on time and in style. Special Events Limos – if you're attending a concert or sporting event, leave your vehicle at home and relax with a hassle-free journey to and from the venue with our limousine hire. Formal Car Hire – enjoy the ride and make a lasting impression when you arrive. Our fleet of prestige hire cars have tinted windows and luxurious finishes for a discreet, comfortable journey. Our immaculate Chrysler 300c stretch limo can seat up to 11 passengers. It comes fitted with a mini bar so you and your friends can enjoy the drive in first class style while relaxing and toasting to a good night of fun. Our people mover vans can carry up to 7 people and 6 suitcases. If you have more than 6 people to transfer from one location to another we will make arrangements for all your troops to get there on time. Are you ready to experience the Brisbane Premier Limo Service difference? Take advantage of our online quote and booking service, or call 0421 409 098 to book your Brisbane Limousine hire today. Call us anytime, we are open for Business 24 hours 7 days a week. For people with pets we do allow pets to be travelled with us. Need a Limo Hire Service near Brisbane? Call us on: 0421409098 TODAY! 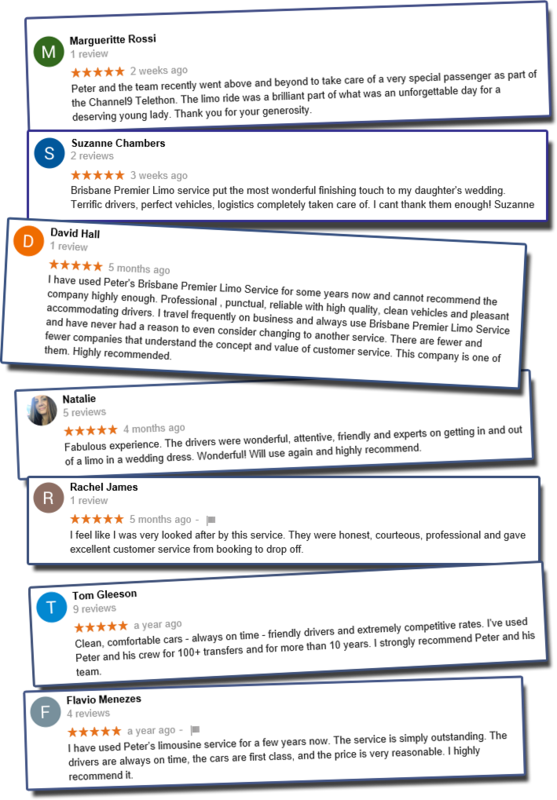 Here are some of our Google Reviews from real clients! We understand that driver and vehicle safety can influence your decision when choosing a luxury ground transportation provider. Since 1988 Brisbane Premier Limousine Service have worked diligently to ensure that the safety of our passengers is never compromised. The cornerstone of our commitment to safety is our ongoing effort to have chauffeurs with impeccable safety records and to purchase and maintain reliable vehicles that come equipped with a wide variety of safety features. We are an accredited transport operator.